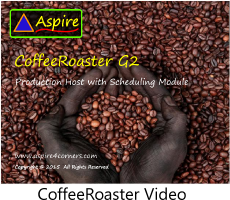 The CoffeeRoaster G2 Production Module is the centerpiece of the CoffeeRoaster Modules. The Production Module is required whereas the other CoffeeRoaster Modules are optional. 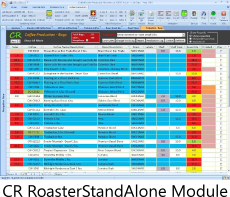 Through the Production Module the 'Bagger' is able to connect to the QuickBooks database and import items into CoffeeRoaster. 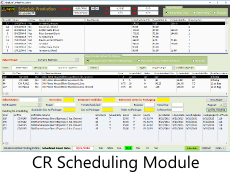 Once the QuickBooks Items are imported into CoffeeRoaster, they are organized into a Roasting (lbs) and Bagging plan which is displayed in the Production -Bags and Roast Totals forms. Configuration of the CoffeeRoaster database can be managed through both the CR Production Module and the CR Management Module. 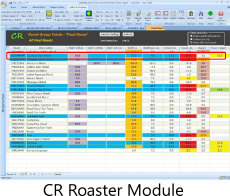 Color coding is used to help prioritize production tasks, in the Production - Bags and Roast Totals Forms a Blue Line indicates that these Coffees/Roasts need to be processed to fill Customer Orders. 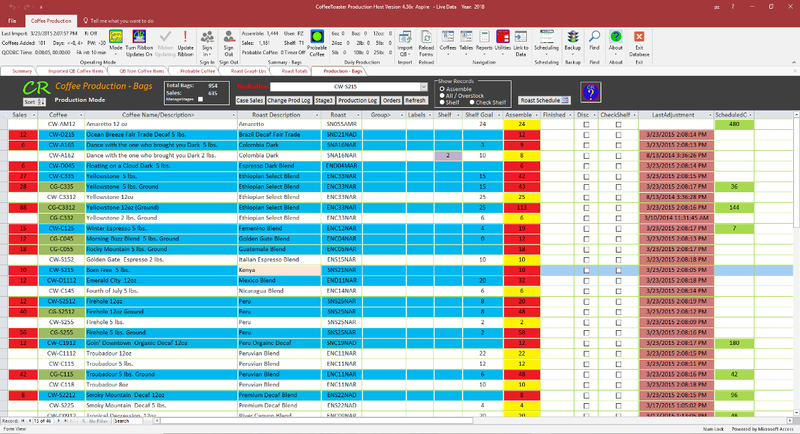 The Production Module allows the configuration of a Shelf Goal for each Coffee, this is essentially the number of Coffees that you would expect to need for the next week. 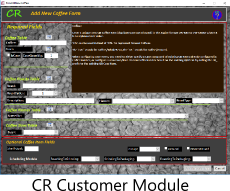 Statistical and Graphical Analysis of individual coffees is available in the Production Module, the Management Module includes statistical and Graphical Analysis of individual coffees and Coffees grouped by Roast. The Production Module can integrate with the optional Green Beans Module on the same computer, additional computers are required to run the Management and Roaster Modules. All CoffeeRoaster Modules are able to read and modify the common CoffeeRoaster data file according to the role of the Module. 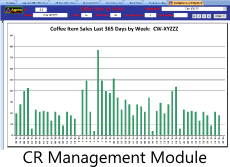 Menus and Summary data are displayed in the CoffeeRoaster Ribbon at the top of the page. The CoffeeRoaster G2 Management Module is designed to run on a separate computer from the CoffeeRoaster G2 Production Module.